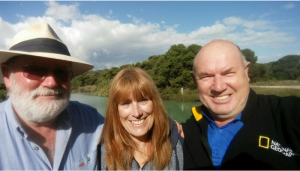 Phil, Jim and Jenny are lifelong friends, all from rural backgrounds and with over 50 years combined experience exploring Australia. Die-hard campers, 4WD enthusiasts and survival experts, they’re passionate about showcasing our incredible country – especially the remote corners that regular tour groups miss. They’ve teamed up to give photographers, adventurers and everyday people the chance to experience Australia’s hidden beauty, gaining a new appreciation for this ancient continent. With two custom-built, state-of-the-art vehicles – one for you, one for support – OZTRAX provides fully-catered, all-equipment-included, safety-first expeditions for small groups. All you need is a sleeping bag, toothbrush, camera and a spare pair of dacks. Based in Adelaide, they work with clients to create extraordinary Aussie adventures. Every nook, cranny, canyon and gorge is fair game. All trips are tailored to season, time frame and budget. Want to know more? Check out our FAQ, give us a call on 0419 850 759 and prepare to go bush.